This page advises readers of developments in the existence of Lost Providence. It will also collect an archive of photographs that add to the collection already in the book but which were either nudged out by the vicissitudes of space in a book, or came to my attention too late to be included in the book. This page will also collect readers’ own favorite lost buildings that did not appear in the book. The photograph at left is a good example of one that is of interest but did not make it in. 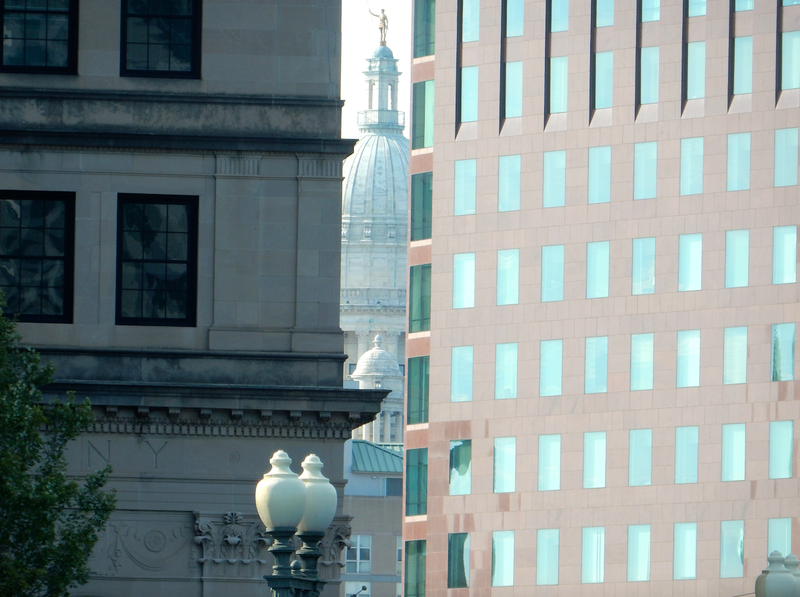 It illustrates how the Darth Vader Building (right) blocks the view corridor to the State House from downriver. You can see that the corridor has become a slit through which the Independent Man atop the dome of the capitol can just barely be seen from the Crawford Street Bridge. The building at left is the old Hospital Trust, now the RISD library and graduate suites upstairs. I hope readers will return to this page and contribute to its dialogue. The latest entries on the page will be at the end. That seems kind of silly, but this is a blog page, not a blog post. I will revise it soon if I can figure that out. Here is the latest update of events planned for Lost Providence. I have been removing events as they occur, and I have been pleasantly surprised at the number of events that have popped up since the dozen or so original events took place. Beyond those below, more events may still be added to the calendar. The first set of illustrations here are the lost buildings in Chapter 11, “Lost But Not Listed.” Other images not in that chapter or the book will follow. Sabin Tavern (1763-1891) – You can see the Gaspee Room, where Providence patriots met to plan the sinking of the British revenue cutter H.M.S. Gaspee in 1773, in an addition to the Mary Arnold Talbot House at 209 Williams St.
City Hotel (1832-1903) was the major downtown hotel before the Narragansett Hotel (1878-1960) was built, and sat until 1903 on a site that is now part of the Johnson & Wales academic quadrangle, on the grass next to its library, Broadcast House (1979, or the East German Embassy. State Arsenal (?-?). The first of the two illustrations above is the only representation of the state arsenal I was able to locate until the second was sent to me by Christopher Martin, editor of the Quahog.com blog. I don’t know when the arsenal in the drawing was built, or exactly how it had been expanded as a mill by the time the postcard was printed, but it was attacked at the outset of the Dorr Rebellion on May 18, 1842. During the rebellion Rhode Island had two sitting governors and legislative bodies. That lasted for about six weeks until the revolt dissolved after the “battle” of Acote’s Hill. The Cranston Street Armory (1907) sits today on the same site once occupied by the arsenal attacked in 1842. Readers may comment on the book by sending an email to the author at dbrussat@gmail.com.